Letterpress Printing is an art form, a medium of expression, a trade for which there were once many labor unions. Its also an obsession, a hobby-on-steroids, and the most fun you could ever have with lead and cast iron. 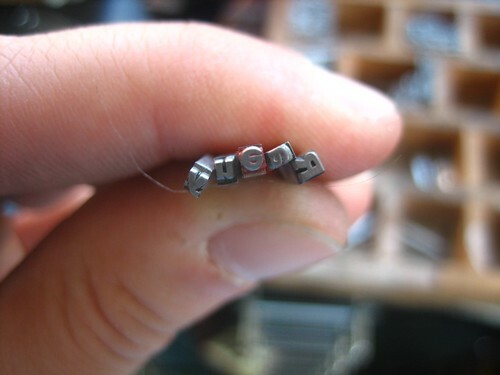 Letterpress printing is an obsolete technology that is the predecessor to modern printing techniques. Once upon a time, every printed character was set one at a time by hand, inked up on a press and printed one page at a time. (Back then, it was just called printing. 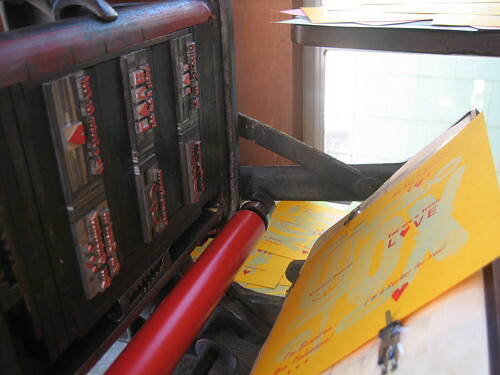 The term “letterpress printing” wasn’t widely used until artists got a hold of it and needed to distinguish it from all the other methods of relief printing.) Letterpress printing faded out when more efficient processes like offset printing made printing faster and cheaper. In the last few decades, even offset printing is beginning to go the way of the Dodo as laser and ink-jet printing technology advances. In the last decade, letterpress printing has resurfaced as a new generation of artists and designers become jaded with strictly digital processes. Many of us began our training with learning some printing techniques on the side. As the industry pulled away from printer-as-designer/typesetter and the “graphic designer’ was born, technology advanced with computers taking the printing world by storm. Its funny to think, that printing remained the same for centuries. Largely unchanged were the methods since Gutenberg popularized his movable type. Sure, there was a lot of refinement and specialization, but mostly, it was unadulterated until the 20th century. When computerized systems were developed, they went from punch tapes to the MacBook Pro in less than a century! This is an amazing feat and something to behold, as my 90 year old friend Bud will attest. 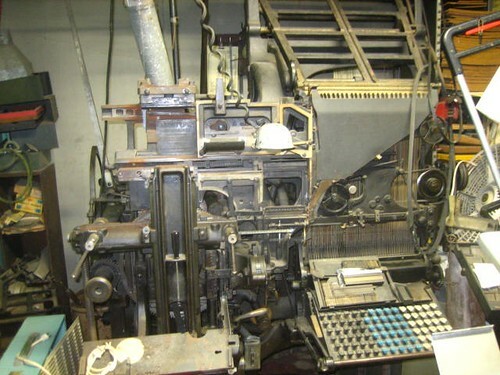 He started out typesetting by hand in grade school, and by the time he got back from WWII in the late 1940’s, automated type setters like the Linotype were standard in a print house. If they did set hand type, it was only to take a black and white proof, and reproduce that as a negative which in turn became a plate for offset litho printing. Now, I’m no where near old enough to have seen this dramatic change, but I can say that even when I was first starting out learning Graphic Design, it was more hands on. We cut and pasted, we actually clipped our clip-art (I know, weird right?). Rubber cement was a requirement, as was your trusty X-Acto. Then in college, it was all computers. You started sketching on the screen and your finished product stayed in the screen until you spit it out of a direct-to-plate machine. No more copy cameras that filled a room, no more darkrooms for washing negatives, no more presses even! Thousands upon thousands of prints are now generated on color laser printers, never even seeing a press. Very interesting! I am very interested in learning letterpress and I read everything I can on it! Inkjet is kinda screwed up. So is digital photography. Scanning is the only part of that paradigm that I think is acceptable, but I need a 4800 scanner. I have been getting good results from inkjet printers, but only if I have about 20 to choose from. It is not like one printer will give my work a single flavor like a printing technique might. So this kinda stuff survives!